The relationship between taste and power is what Karl Marx would have called dialectical; for today’s Russian oligarchs that’s a red flag – in the race track, not the Marxist sense of the term. The oligarchs don’t mind showing off their taste in foreign places and foreign newspapers; inside Russia they show a guarded respect for the Nicholas Fouquet example. 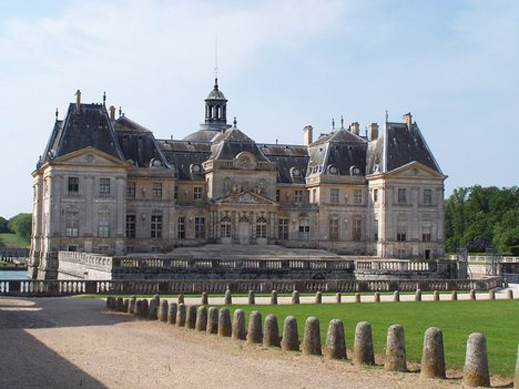 He was the treasurer and prime minister of French King Louis XIV, whose royally paid-for rise to wealth was turned into a grand chateau near Paris , Vaux le Vicomte (image below). That was so richly ornamented and stocked – ostentatious in contemporary terms — that it made the king jealous, as well as fearful for his own treasury and power. So he packed Fouquet off to jail to serve as an example for his fellow courtiers and concessionaires for 19 years — the rest of Fouquet’s life. Mikhail Khodorkovsky’s education apparently didn’t stretch to that story of 17th century France. His stretch in prison might be long enough to read up. If Fouquet were alive to teach Khodorkovsky a lesson or two, he would counsel the moderation he acquired from reflection behind bars. He also would have warned against taking mobile telephone-calls when in the presence of the king. No doubt Khodorkovsky would reciprocate with a warning to Fouquet to put his toys and palaces in offshore havens, where the king can’t see them. Here is Prokhorov showing his taste to the CBS television network’s investigative series, Sixty Minutes. A gilded display is disclaimed as his interior designer’s idea, not his own. Sagely, Prokhorov corrects the reporter’s mistake – the unplayable musical instruments are cellos, not double-basses. In retrospect, Prokhorov might count himself lucky he lost his deposit for the French Riviera palace he tried, semi-secretly, to buy. Across the Russian frontier, on the outside, Deripaska and his onetime partner in Rusal, Roman Abramovich, are less inhibited in displaying, more confident in asserting the taste that Londoners now recognize as neo-Russo-pseudo-Classical. This is how the new revolution in Russian residential architecture looks – Deripaska, picture no. 4, and Abramovich, picture 5. 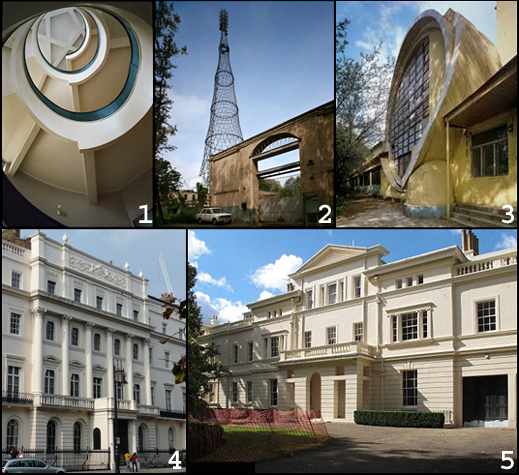 At the latest London show of Russian architecure between 1915 and 1935, now running, you would expect the local Russia-hating newspapers like the Telegraph to find the exhibition to be a monument to what some British think should be buried and forgotten. Especially the Cheka Housing Complex of Yekaterinburg (1929-35 – picture 1); the Shabolovka Radio Tower (1922 – picture no. 2); the Gosplan Garage of Moscow (1936) – picture no. 3); and the Lenin Mausoleum (1924-30 – see below). These are by far the most beautiful of the exhibits, attested by the crowds of young students from all over Europe who have flocked to the show, undeterred by the reviews. 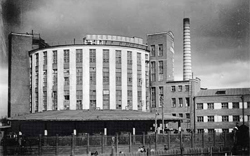 My personal favourite, because I have lived in sight of it for more than twenty years without suffering damage to visual receptors or taste, is the bakery at 2, Khodynskaya Ulitsa, Moscow (1931). The Telegraph was soft-soaping its readers’ aesthetic sensibilities. Try the really detergent stuff from The Arts Desk, which has complained that the immorality of recent Russian (Soviet) history is just too great to justify stopping in admiration of any beauty from the time. Here’s the bakery again: “There is never, at any point, any question of the aesthetic value of what is on show. That is peerless. But when one looks at photographs of mass-production bakeries, and reads the captions stating that in the 1930s these were created to feed the workers, without any mention of the tens of millions of fellow workers who were being starved to death by the very same state that was building these model factories, well, one would wish for more editorial comment from the exhibition’s curators.” The Arts Desk. Moscow commentary has been timid and sparse. Just two notices were published of the exhibition at its opening – one in Izvestia and one in Itar-Tass. Then it was left up to one of the non-Russian curators of the show, Mary Anne Stevens, to explain away all the internecine fighting between architects, individual artists, studios and collectives over big-money commissions and contracts they thought the Soviet state budget should hand over. Don’t blame the lobbying, money-grubbing, stab-in-the-back abstractionists and suprematists, the curator said on Radio Svoboda – blame Stalin instead for his taste in figurative representation. 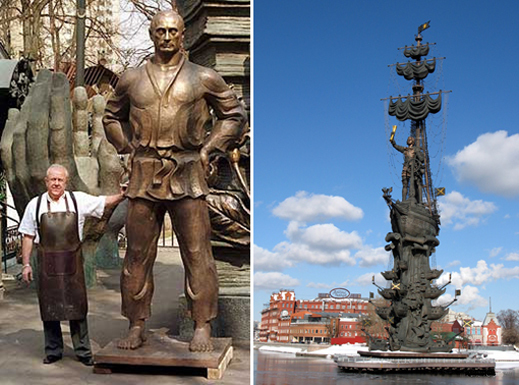 The show reveals some Russian names and works long buried under prejudice or ill-education. Take Gustav Klutsis, for example, forgotten inventor of the Moscow street kiosk to sell something more than booze and smokes. Klutsis, a Latvian, had fought for the revolution in the Latvian Red Rifle regiment. He then decided to study art in Moscow. Think about that – because he didn’t last long, and left little trace in the city today; Klutsis died in 1938 at age 43. 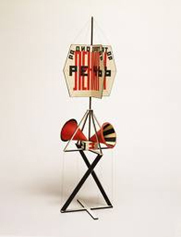 Among his designs illustrated in the London show are ten for kiosks, rostra, public displays. Now that we accept how much City Hall corruption was behind the appearance of the kiosks in 1991, what revolutionary impulse, futurist retro, would be required to put Klutsis kiosks on the streets today? After you have been through the exhibition rooms once or twice, and have read the 271-page illustrated catalogue, there may come an epiphany from Richard Pare, the photographer responsible for the displays of the buildings which survive still. In an interview published beside his photographs, Pare is speaking of the revolutionary impulse among the architects and designers displayed in the show, who were motivated by a “very conscious desire to get away from the architecture of the regime that had gone before”. “Architecture under state patronage in the Tsarist period,” says Pare, “had looked backwards to produce bankrupt works in a rigid proto-medieval style. 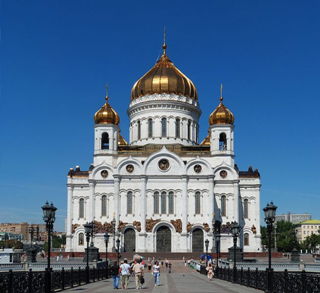 The prime example is a church in St. Petersburg that was built [in 1893-1907] on the spot where the assassination of Alexander II took place. The classical line of the canal bank of the original town plan was even broken to accommodate it. The result was an extraordinarily vulgar concoction of church architecture”. Let’s hear it for the vulgarity standard, even if Pare doesn’t go so far as to apply that to the constructions of Moscow and St. Petersburg since 1991. Particularly not of churches. Noone has – because the demolition in Moscow of the Soviet-era public swimming pool construction to reinstal a copy of the Cathedral of Christ the Saviour has never attracted the unlicensed, democratically liberated assessment of the Russian architectural profession, nor of their fellow-travelling artists and culture conservators. In one of the most dramatic displays of artistic freedom since the fall of communism, none of them has dared. So what, if anything, is better in Russian urban architecture than the constructions of the Academy show, now, ninety years later, that Russia is free at last? For the icons of post-1991 modernism in Russia, Norman Foster’s Hotel Rossiya might be judged to be no worse, but also no better, than its late Soviet, maligned and now dismantled predecessor. And if it were not for the massive contracting scandal embroiling those two quondam bosom friends, Shalva Chigirinsky and Yelena Baturina, Fosterism might have become the new standard of Russian built city aesthetic. Let it be said right now that among Moscow oligarchs, none had a more cultivated taste in 18th and 19th century Russian painting than Chigirinsky, if the selection for his office walls is the criterion to judge by. But when Foster proposed turning the New Tretyakov Gallery and the Central House of Culture (TsDK) into a gigantic peeled orange, the concept of post-revolutionary modernism hit its dead-end. Commercially, that’s also the point at which Chigirinsky arrived, and politically where Mayor Yury Luzhkov was to follow shortly thereafter. As for factionalism and favouritism, which did as much to destroy the artists remembered in the London Academy show as Stalin, the dynamics between the city and federal authorities and the scheming artists have been no different since 1991. Mayor Luzhkov’s patronage of Zurab Tsereteli (below, left) cannot fail to show that, even if we must wait another near-century before it will be time for an Academy show of their collaboration. 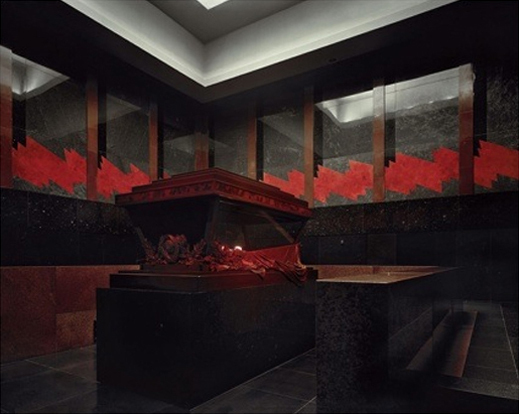 By then it may be possible to judge that on Tsereteli’s standard of monumentalism, Lenin’s tomb is an enduring work of genius – and, dare we admit, Constructivist, if not quite Suprematist pleasure.